This project is driven by the desire of the owners to escape from intense urban stress of a modern city. The building is an extension to their existing holiday house. The design of the extension therefore became an embodiment of the polar opposite elements of living in a city; space, horizon, light, vegetation. Thus the extension became an exercise of making outdoor space inhabitable. The original cottage was built in 1948 by the local council to rehouse the remaining families of nearby Inishmurray Islad. The new owners also have a great fondness for the Island which represents their ideal escape from the city. The extension was then a fusion of the conveniences of modern living with the openness and tranquillity of a remote island in the Atlantic Ocean. The living space is located between two thick stone walls, typical of exterior conditions, which have grown to include the utilities for living. These thick stone walls will be built to match the style and technique of the monastic ruins of Inishmurray. Resting on top of the two walls the ground has been transplanted as a roof, recycling the grass sods taken from the site. The roof takes on a secondary function of providing services for the space below; light, entertainment, ventilation, screening. By providing all the services in the walls and roof the openness of the extension can be maintained, with a glazed screen providing the necessary shelter from the elements. The proposed extension intends to take full advantage of living in the country. The living element of the existing house currently has no visual connection to the nearby seashore and landscape. The living room and kitchen face the road and the main entrance is on the road side of the building. The applicants both have demanding careers working in a crowded city and need to retreat to this beautiful location to relax. They embellish being in the country and outdoors. If the Irish climate was a little more forgiving they would be outdoors every day. Unfortunately this is not the case so the proposal is designed to give the benefits of outdoors while being sheltered. Conceptually, shelter will be provided by basic means. We will literally lift the surface of the ground and make a room underneath. The grass roof will reuse sods taken from the site. They will be placed in the same location on plan from where they were taken, this time only a few meters higher. The interior walls of the living/dining room will be constructed with natural dry stone that are typical of exterior conditions. Therefore the living/dining room will have the feeling of outdoors thus becoming an extension of the garden. The cluster of houses to which this house belongs was constructed in 1948 by the council to relocate the inhabitants of Inishmurray*1. Once the islanders had settled into their new houses they began to long for their lost homes. This yearning for the Island can still be felt in the houses today. 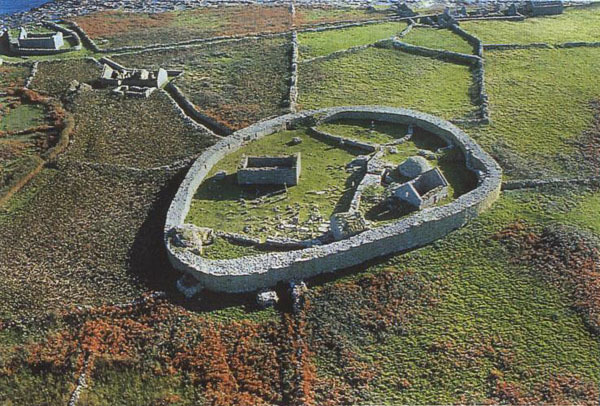 The new owners also have a great fondness for Inishmurray, with it monastic ruins and rugged landscape. The design of the proposed extension became a way to link the house back to the Island. 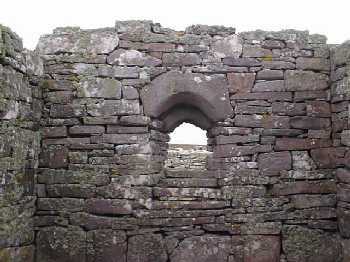 On visiting the monastic ruins of Inishmurray one is struck by the power and presence of the encircling defence wall. This brings security and calmness as one enters. The proposed extension will capture this feeling of openness and security by containing the living/dining room between thick natural dry stone walls. Recycled natural stone will be used in the proposed extension so that the walls will have a weathered appearance like the great walls on Inishmurray.